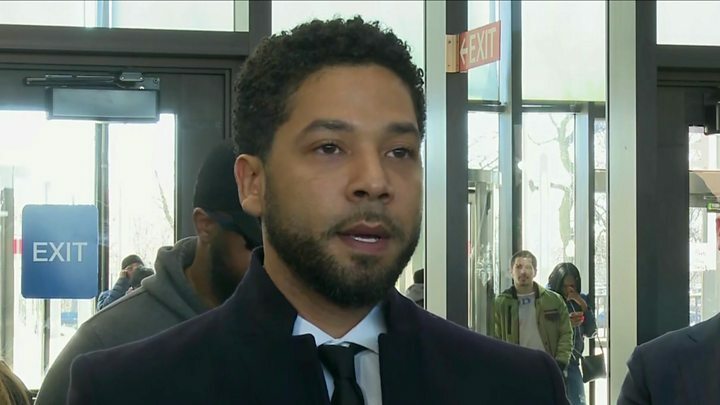 Prosecutors have dropped all charges against US actor Jussie Smollett for allegedly staging a racist and homophobic attack. The Empire star attended a court hearing in Chicago on Tuesday, where a judge sealed the case. Mr Smollett, 36, pleaded not guilty this month to 16 counts of disorderly conduct for allegedly lying to police. The city's mayor denounced the prosecutors' decision to drop the charges as a "whitewash of justice". Mr Smollett told reporters after his court appearance: "I have been truthful and consistent on every single level since day one. "I would not be my mother's son if I was capable of one drop of what I've been accused of." 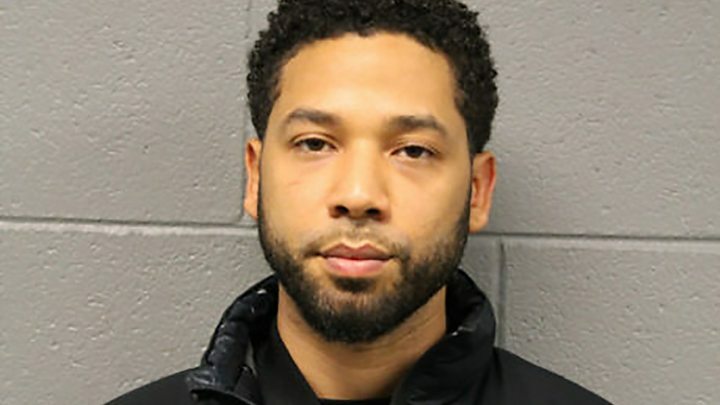 The office of Cook County State's Attorney Kimberly Foxx said in a statement: "After reviewing all of the facts and circumstances of the case, including Mr Smollett's volunteer service in the community and agreement to forfeit his bond to the City of Chicago, we believe this outcome is a just disposition and appropriate resolution to this case." It remains unclear why prosecutors dropped the charges against Mr Smollett. Chicago police Supt Eddie Johnson said he was not briefed on the decision to drop the charges. 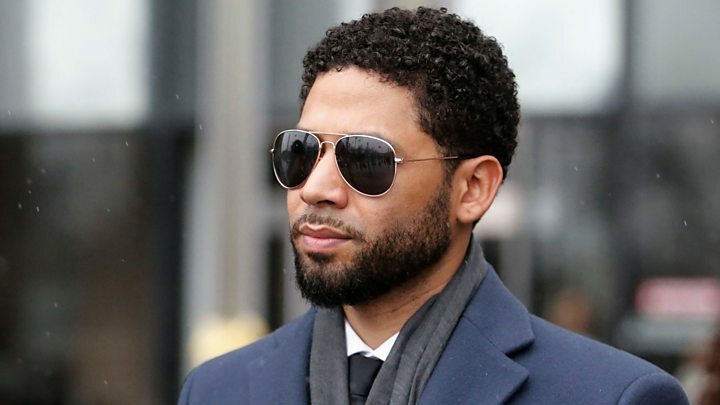 Mr Smollett voluntarily agreed to give up his $10,000 (£7,500) bail money, his lawyer said, emphasising there had been no deal with state prosecutors. What is the city's reaction? Supt Johnson said in a news conference on Tuesday that he felt justice had not been served and "the city is still owed an apology". "If someone falsely accused me I would never hide behind a brokered deal and secrecy," he told reporters. "At the end of the day it was Mr Smollett who committed this hoax. Period." Chicago Mayor Rahm Emanuel accused Mr Smollett of fabricating a hate crime "all in the name of self-promotion", adding that he took "no sense of ownership of what he's done". The mayor added the case would cast a shadow over genuine hate crimes as they decide whether to come forward. What does the Smollett camp say? Mr Smollett's attorneys, Tina Glandian and Patricia Brown Holmes, said in a statement their client's record "has been wiped clean". "He was a victim who was vilified and made to appear as a perpetrator as a result of false and inappropriate remarks made to the public causing an inappropriate rush to judgement," the lawyers said. "Jussie and many others were hurt by these unfair and unwarranted actions. The entire situation is a reminder that there should never be an attempt to prove a case in the court of public opinion." Media captionJussie Smollett: "I have been truthful since day one"
Mr Smollett's family said in a statement to US media on Tuesday that the actor had suffered a "heartbreaking" ordeal. "Jussie is a son, a brother, a partner, a champion for human rights, and a genuine soul who would never be capable of what he was falsely accused of," said their statement. "He was the victim of an assault and then falsely blamed for his own attack. This morning truth has prevailed and he has been vindicated." Mr Smollett stars as a gay musician on Fox's drama series Empire, which follows the ups and downs of a family-owned hip-hop label. The verified Twitter account of the writers' team on Empire posted a celebratory tweet after Mr Smollett's court appearance. How has the case unfolded? Mr Smollett said he was attacked in the early hours on 29 January in downtown Chicago outside a sandwich shop by two masked men who shouted racist and homophobic slurs, poured bleach on him and put a rope round his neck. He claimed they shouted: "This is Maga country", a reference to President Donald Trump's "Make America Great Again" campaign slogan, and that at least one of the assailants was white. But Chicago police said Mr Smollett had paid two brothers, both of whom are black, $3,500 to stage the attack because he was "dissatisfied with his salary" on the TV show. His lawyer maintained outside court on Tuesday that the cheque was for nutrition and physical training. Ms Holmes also alleged that brothers Abimbola and Olabinjo Osundairo, who apologised for "their involvement in this situation" earlier this month, were Mr Smollett's attackers. "We already know who attacked him," the lawyer told reporters. "The two brothers have said that they attacked him." Authorities had also accused Mr Smollett of sending a racist and homophobic letter to himself at a Fox studio beforehand. The US president lashed out last month at the actor on Twitter for his "racist and dangerous comments".